Be careful, large images can slow down your website or blog. A slow loading website could cause a potential customer (subscriber) to leave without reading your post. Luckily, there are lots of free tools and plugins you can use to help keep your pages loading as fast as possible. Where possible try and use JPG images. JPGs tend to load faster, which is great for your visitors and for SEO. The Radical Image Optimization Tool (RIOT) is a free image optimizer that will let you adjust your image’s compression parameters while keeping the minimum file size. Here are a few more image editors you may want to consider if you plan to compress images before uploading them to your website or blog. WordPress is extremely functional and many people choose to edit their images once they have uploaded them. One of the easiest methods is choosing one of the presets Large, Medium or Thumbnail when inserting an image into your page or post. You also have a fourth option “Custom” which allows you to specify the width and height of the image. 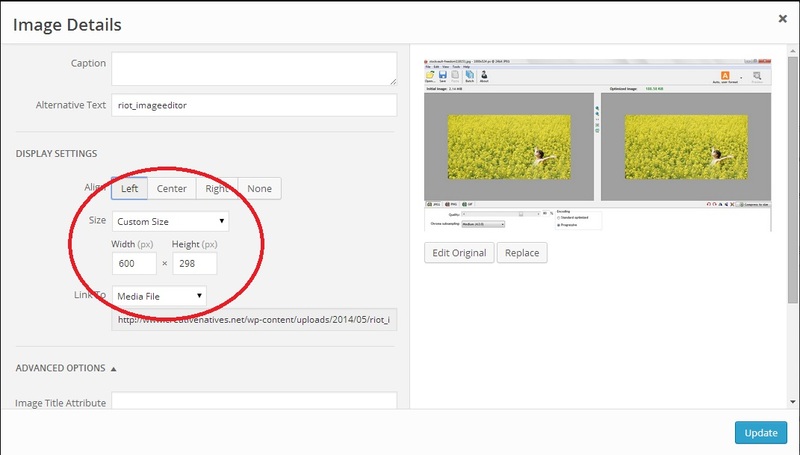 Its important to remember that with this option, the image is still pulling the large image, it is just “squeezing” it into the sizeyou specify, thus this does not reduce load time. WP Smush.it. This plugin will compress all images you upload automatically. It will aslo compress any existing images, making it very useful if you have a lot of old posts with large images. Lazy Load. This plugin helps reduce image loading time by showing images as you scroll through the page. EWW Image Optimizer. This plugin compresses your images as you upload them. Thanks Max. Very nice and simple to use.